Three of Newark's best-known statues were made financially possible by one man, Amos Van Horn, who owned one of the city's largest furniture stores in the second half of the last century. As with the Frelinghuysen and McCarter families who lived in outlying counties, the Van Horns moved into Newark in the mid-19th century, mainly because Newark was literally the business hub of New Jersey and the place to make a fortune. While Van Horn and his family were not tremendously wealthy individuals like the Somerset County Frelinghuysens or the Sussex County McCarters, Van Horn was a very prosperous businessman who set up a substantial endowment, which we still enjoy whenever we look at the Seated Lincoln in front of the Essex County House, Gen. George Washington who patrols the south end of Washington Park and the Wars of America in Military Park. Born in 1840, Van Horn served in the Civil War and considered himself fortunate to have survived its terrible battles. This may have led to his great respect for men and officers at war, and perhaps to the selection of the three statues. Upon his death in 1908, the Van Horn Endowment amounted to a little over $150,000. According to the will, $25,000 was allotted for each of the Lincoln and Washington statues and $100,000 was to be set aside for the 42 heroic-sized figures in the Wars of America grouping at Military Park. The first statue of the Van Horn gift, completed and dedicated in 1911, was The Seated Lincoln in front of the Essex County Court House. It was unveiled by former President Theodore Roosevelt before an estimated crowd of 20,000 to 40,000 Newarkers. 'Surrounding the court house plaza, in the stands, on the sidewalks, in the streets, on the courthouse steps, in the windows and on the roofs and extending in an almost solid mass from High Street (King Boulevard) to Plane Street (University Avenue), the crowd formed the largest gathering the city had (ever) known.' Oppressive heat felled many weaker and elderly attendees before the ceremony was completed and several 'old soldiers were obliged to move out.' In an air of continuous excitement and in front of this huge mass of individuals, Teddy Roosevelt asked that America pay attention to the spirit of Lincoln. He suggested that 'the greed of conscienceless wealth must be checked, and that anarchy must be repressed. We must stand for clean politics and clean business or we will defeat the spirit of Lincoln.' The ceremony concluded at Old First Church and included orations and speeches galore. Military music of all sorts was performed. The event ended with the singing of the national anthem. The bronze statue of Lincoln, which cost $25,000, was the creation of Danish-born Gutzon Borglum. 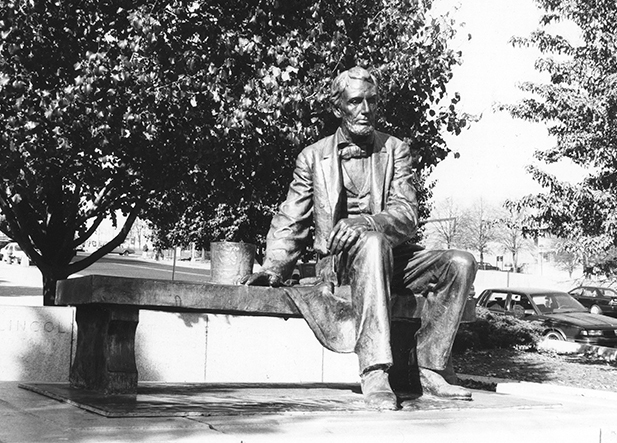 Cast in one piece by the Gorham Manufacturing Co. of New York, in its Providence, R.I., foundry, it depicted Lincoln deep in thought, seated on a rectangular bench with his top hat to one side – a position that makes the work vastly different from other Lincoln statues throughout the nation. In the 1970s, several attempts were made to relocate it. One suggestion came in 1973 when an Essex County freeholder suggested moving it to a more prominent location in front of the newly built county courts building on West Market Street. Former Essex County Counsel Francis McQuade researched the background on the monument and ruled that while it was located on county land, it was the property of the City of Newark. He concluded that a move might affect its ownership. Another attempt was made to temporarily relocate the statue for cleaning and to cast replicas from the original work. That effort also failed. Thus, the likeness of the former president remains where it has sat since 1911. McQuade's mandate that 'Lincoln belongs to the ages, but this statue belongs to Newark' has kept it as the guard of the Essex County complex at Springfield and West Market streets for the past 86 years. The second Van Horn gift was the Washington Statue at Broad Street and Washington Place. Dedicated in 1912, it is considered by many as one of the best Washington statues in the United States. Unlike many other memorials to the country's first president, this equestrian version portrays Washington dismounted. The sculptor, J. Massey Rhind, 1860-1936, was born in Scotland, and came from a family of sculptors. He studied in Paris, came to the United States in 1889 and had studios in New York City and Alpine, N.J. When Rhind created the Newark statue of Washington, he was already famous for the sculptures in the transept of the Cathedral of St. John the Divine, the transept of St. Mary the Virgin in New York City and the classical caryatids of Macy's 34th Street flagship department store. Newark's Washington is giving his farewell address to his troops at Rocky Hill near Princeton after the Revolutionary War. Unlike his famous farewell to his officers at Fraunces Tavern in New York City, this statue represents his leaving the men of the Army – the fighting force that had supported him through the terrible winters early in the war. The heroic-sized statue is located at the southeastern tip of Washington Park atop an earthen mound. It was cast in bronze at the Roman Bronze Works in New York, and signed on the back by Rhind. The statue's details are unimpeachable as to historical costuming and trappings. Although they have been somewhat damaged in past years by vandals, the statue remains a wonderful work of art. The work originally rested on a 10-foot-high mound festooned with autumn leaves of laurel, oak and hemlock for the dedication. Today, it stands on a base covered with sprays of tea symbolizing the spirit of the Revolution. The Washington statue was dedicated Nov. 2, 1912. Originally, President Howard Taft was scheduled to officiate at the event. However, the sudden death of his vice president and the pending presidential election resulted in the president's last-minute absence. Dr. William J. Dawson from Old First Presbyterian Church sprang to the rescue, presenting the oration as if he had been preparing for months. Afterward, Sen. James Smith Jr., who lived across the street from the park at 14 Washington Place, hosted a luncheon attended by the local gentry. Through this courtesy, the wives of many visiting dignitaries interested in the unveiling were comfortably installed in the windows of the Smith home. They were received and entertained by the senator's daughter, Mary Smith. Some of the well-known names appearing on the calling cards on the silver tray in the Smith's drawing room included Rhind, Bannwart, Urquhart, Frelinghuysen, Scudder, Haussling, and, of course, Dawson. The latter's dedicatory speech was brilliant. With the Rev. Dr. Folsom's poem, Supreme Court Justice Swayze's speech and Mayor Haussling's acceptance of the statue for the city, it was a noble contribution to a memorable event. The Wars of America, located in Military Park, is Newark's grandest statue as well as a very well-known American sculptural composition. Gutzon Borglum's second-largest sculpture group, aside from Mount Rushmore which depicts the faces of the four presidents, is the newest of the Van Horn gifts, made possible by an ordinary man who greatly admired his adopted city. Gutzon Borglum was born in Idaho in 1871 and educated in Kansas. He studied in Paris under Auguste Rodin. Before coming to Newark, where he made the Seated Lincoln, he created a colossal head of Lincoln at the Capitol in Washington, gaining fame from his Connecticut studio also as a writer, painter and lecturer. Nothing created before or after his Wars of America has ever created such an impression in Newark's artistic circles. Set in the middle of Military Park, one of the nation's oldest parks, the monument is dedicated to the soldiers, sailors and marines of four American wars: the Revolution, Civil, Spanish-American and the Great War. The complex piece rests on a granite base of 63 tons and includes 42 heroic-sized figures. The four figures leading the pageant are men dressed in uniforms of the wars they represented. American idealism is portrayed by the presence of youth. Included in the grouping is a solider bidding goodbye to his wife and child, a top sergeant arguing with a conscientious objector, a mother comforting herself and child as her husband has left to defend the country, a departing aviator, and a father giving comfort to his daughter whose husband also has left to join the ranks. Beautiful horses represent strength and valor. Also included among the figures is that of donor Amos Van Horn, the man whose fortune made the entire work possible. One writer summed up the importance of the Wars of America this way: 'This epic in bronze proclaims that our city was glorified with noble deeds written in war and life-blood in every time of national peril; that our contribution was as big and whole hearted in the late war as in the Revolution and the Civil War. The moving, throbbing pageant is a new document in American history to preserve freshly the memory of great events and of noble men (and women) and by doing so to cherish the greatness of the state and to inspire noble citizenship.' Modeling for the project was done at Borglum's studio in Stamford, Conn., and then was sent to Florence, Italy, where the bronze casting was completed. Dedication of the memorial took place on Memorial Day, May 31, 1926, in a light drizzle that failed to discourage thousands of proud onlookers. Unveiling was by Alice Mae Waer, great niece of Amos Van Horn, followed by a military salute and the placing of floral tributes by scores of patriotic societies. The 113th Infantry Band played 'The Star-Spangled Banner, ' accompanied by Carl Bannwart. Gutzon Borglum presented the monument to Ralph E. Lum, trustee of the estate, who in turn presented it to Mayor Thomas L. Raymond. Once again, the Rev. Joseph Fulford read a poem composed for the occasion, and there was a signing of deeds and documents making the event official. Brig. Gen. Hugh A. Drum represented the U.S. secretary of war, and Gov. A. Harry Moore presided. A closing prayer was offered by Rabbi Silberfeld and the benediction was concluded by Rev. Edward F. Quik. Taps closed the ceremony. Although dozens of important outdoor sculptures were dedicated in future years, none was ever to be as magnificent as the Borglum war monument. In many ways this was one of the last great public projects completed before the Great Depression of 1929.